Shatterproof polycarbonate doors allow 100% visibility whilst maintaining the highest levels of security. The Probe Vision Door Lockers are fitted with see-through polycarbonate doors, thereby providing full visibility of the contents stored within. Our customers often use these lockers in high security or sensitive environments. 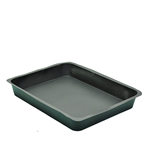 Polycarbonate is known for its robustness, therefore while maintaining transparency, it provides utmost security. 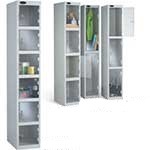 Furthermore, the transparent lockers are fitted with a micro sprung 10-disc lock that features a staggering 3000 serial combinations ensuring security of the lockers contents. If you’d prefer, the Probe Vision lockers are available with padlock fittings instead. 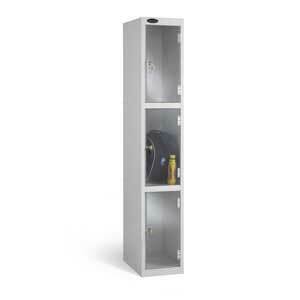 The sturdy construction of this see-through locker gets a further boost with a full width welded plinth for a stable and strong base. 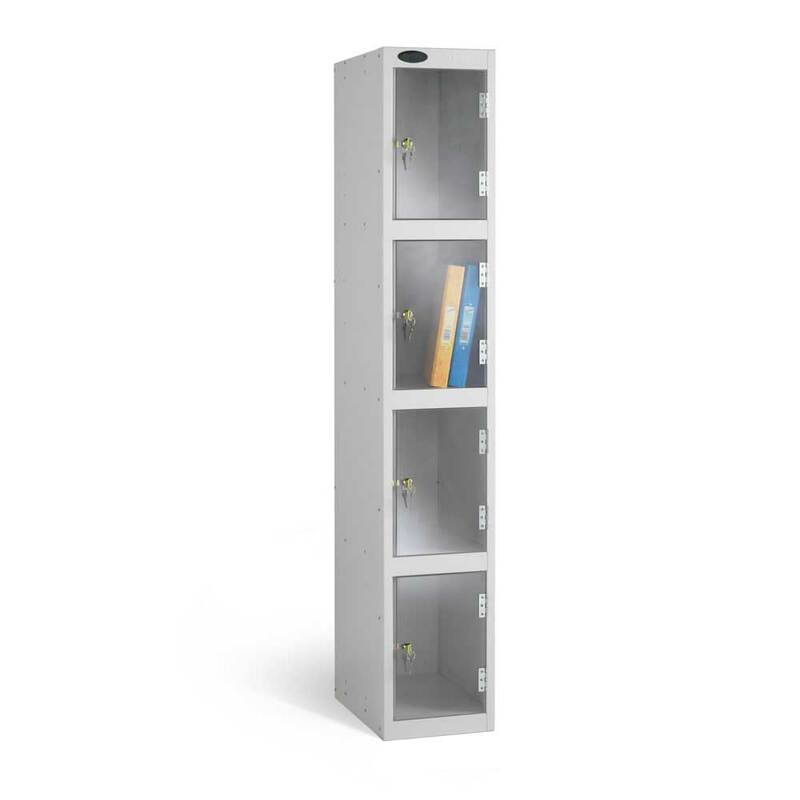 In the Probe Vision range of transparent lockers you have a choice of three depths and five different compartment heights, with the number of door varying depending on the options you choose. If you intend clothing to be stored in the lockers then please opt for the single or double compartment options, because they come complete with coat hooks for this purpose. For a hygienic, as well as secure locker room, these lockers feature the ActiveCoat paint finish to inhibit bacterial growth. The carcass of the Probe Vision door locker comes in a choice of smoke white or silver grey.